Cities all over the country have parks dedicated in the honor of local citizens, and many of them have the same attributes as this one – benches, trees, walking trail and plenty of grass for picnics. Compared to other parks, this one is small, as it sits in a triangle of crossing streets. It is as if the small town of Holcomb, Kansas needed to do something with land that had been cut off from use and thought a small greenway would be a perfect solution. However, this park does not honor a founding family or a local politician. It is dedicated to the family of Herb and Bonnie Clutter, which was slaughtered when their home was invaded by robbers in 1959. Tragedies such as this happen in cities all over the nation as well, and as years pass those incidents, also tragically, fade from the memories of those communities. In today’s world, we seem to be desensitized to the violence that happens around us. Bridges are named for fallen soldiers, but we hardly think about them as we pass by the signs. There may be other parks honoring murder victims, but they must be few and far between. 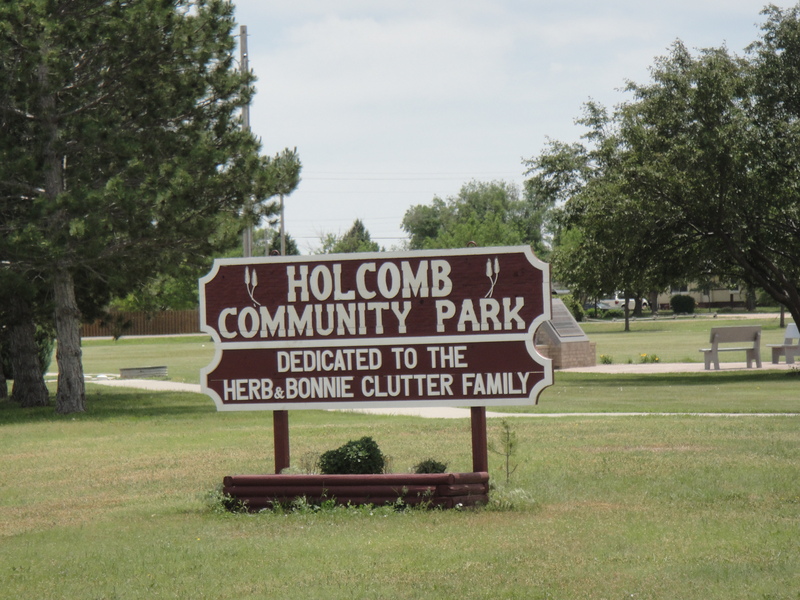 So, why did the citizens of Holcomb build a park in honor of the Holcomb’s? Because several years after the attack, the murder in rural Kansas became known to people throughout the world. The few people I saw stared at my rental car with the Tennessee tags and gave me the “what are you doing here?” look. And, I am sure they are used to a few people stopping by because of the town’s notoriety. I can’t imagine the reaction of the citizens of 1959 Holcomb when Truman Capote – he of the high society and fashionable side of New York City – arrived with his peculiarities. Likewise, I can’t imagine Capote’s thoughts when he arrived in a little town surrounded by nothing but flat plains. A more odd meeting of cultures is difficult to think about. Despite of the strangeness of it all, or maybe because of it, I suggest a stop by the park to anyone who finds themself in the vicinity of Holcomb. Take a stroll around the walking trail or sit on a bench and take yourself back to 1959. Picture Capote and Lee hanging around town and interviewing people. Think about the reaction of the authorities when the pair walk in and start asking questions. And, imagine the journey that the writers took to dig deeper into a newspaper story. However, do not forget the Clutter family; the crime that struck down parents and two children; and the two other children left to live with the pain and the constant, best-selling reminder of the horror of their lives.